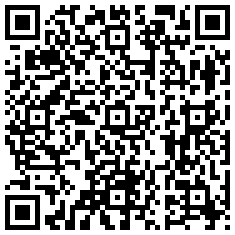 With this application you can find optimal combinations for any objective. Get the maximum benefit or the effects you want. 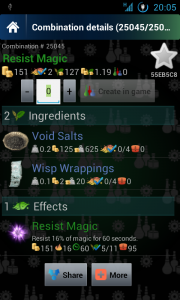 Create pure potions and poisons. 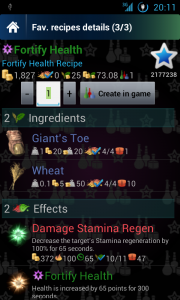 Create recipes to discover the largest number of effects. 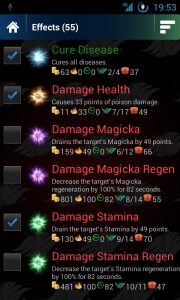 Try different alchemy perks before upgrading. Increase quickly your gold and your skills. 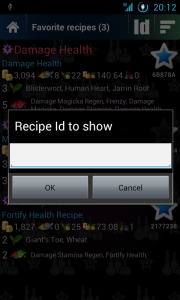 – Calculates all available recipes you can do with a set of ingredients. 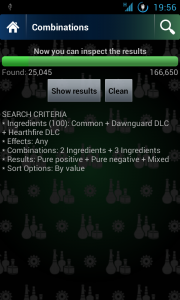 Searches by all the 33,682 optimal combinations with all common ingredients, Dawnguard, Hearthfire and Dragonborn DLCs. 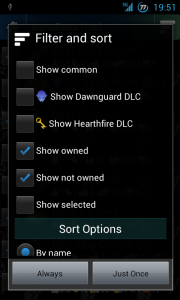 – Allows you to manage many character status. 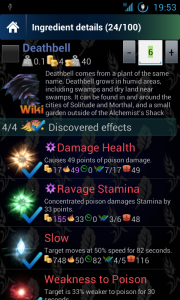 It remembers current skills, selected perks and equipment of the character. 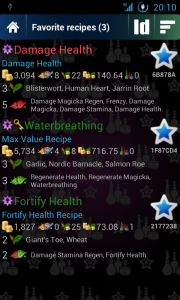 These values ​​have influence on alchemy results. – The value, magnitude and duration of effects in the recipes are calculated taking into account the character status. Therefore, the effects are the same in the game. – Takes into consideration “special” ingredients which multiply (sometimes x100) the value, magnitude and duration of some effects. 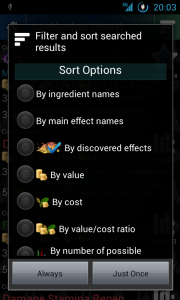 – You can save ingredients information on every character status: selections, the amount you have and the discovered effects in the game. 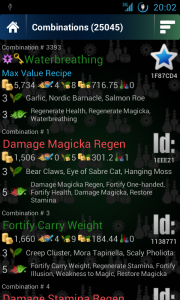 – You can use these information in searches to find available recipes with your inventory and new recipes to discover new effects. 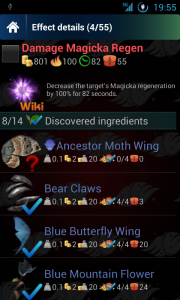 – When you make a recipe in the game, you just have to push a button to update the discovered effects and number of ingredients. There’s no need to update manually the character status in the application. – You can do quick searches by simply selecting ingredients from the list. You don’t need to set the character status, or inventory, or discovered effects. – Search results can be re-filtered and sorted without having to do a new search. – Save your favorite recipes and share them by an unique ID. You can share them using applications, social networks and the web. – You can search for recipes using the unique ID, which are the same in all languages​​. – Valid for all versions: PC, Xbox 360 and PS3. * Ingredients: Determined by the inventory, selected ingredients or DLCs. 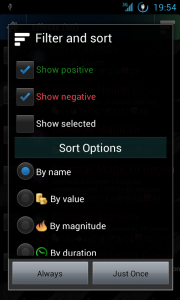 * Effects: Several options depending on selected effects. * Combinations: Two and / or three ingredients. * Results: Several options depending on whether they are special, pure, or use DLCs. 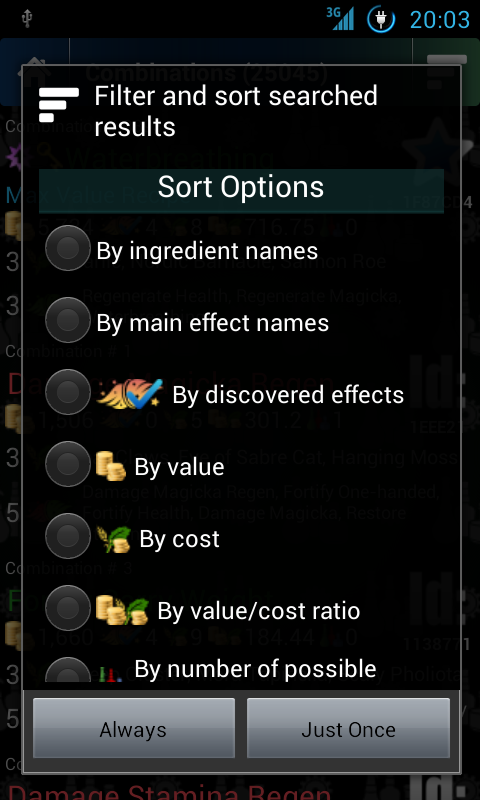 * Sort: By ingredient names, main effect names, number of discovered effects, value, cost of ingredients, ratio value/cost, number of possible potions, recipe ID, favorite recipe name and number of effects. 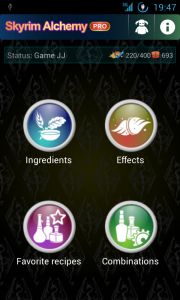 Skyrim Alchemy FREE: Free version is fully functional but has ads and search is limited to one per minute. However, during that time you can filter the results of the previous search. The favorite recipes are limited to 5. 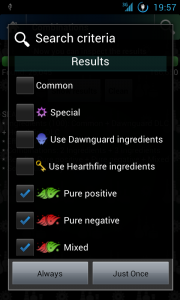 Skyrim Alchemy PRO: Pro version has the same functionality, but it has no ads and no limits. – Fully translated into ENGLISH, SPANISH, GERMAN, CZECH, FRENCH, ITALIAN, POLISH, RUSSIAN and JAPANESE. ACCESS_COARSE_LOCATION: Required for ads (AdMob). 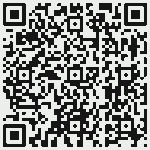 INTERNET and ACCESS_NETWORK_STATE: Required for ads (AdMob), wiki details and share recipes (AddThis). WRITE_EXTERNAL_STORAGE: Required for share recipes (AddThis). – New ingredients from Dragonborn DLC. 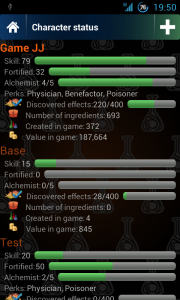 – Now the ingredients selection is saved in the character status. 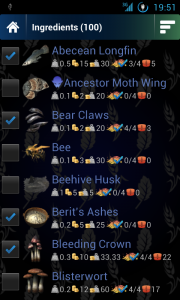 This allows you to search more easily, without having to keep your inventory up to date. Longpress over the ingredient checkbox shows selection options. – New ingredients from Dawnguard and Hearthfire DLCs. – Save favorite recipes and share them by ID. 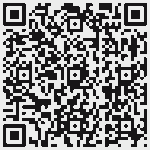 From applications, social networks and web. – Search recipes by ID. – Images of ingredients and effects. 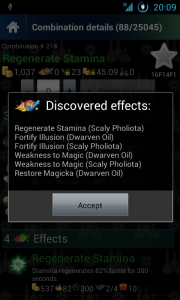 – Now you can fortify alchemy above 100%. 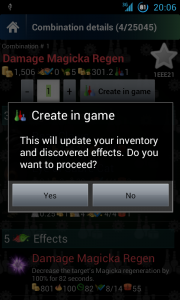 – Create in game several times the same recipe. 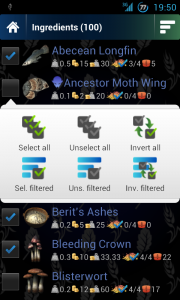 – New options for filtering and sorting. – Descriptions of effects in 8 languages​​. – FIXED: Crash on Honeycomb+ when the network failure. – Lots of bug fixed. – Ingredient names and effects translated into GERMAN, CZECH, FRENCH, ITALIAN, POLISH and RUSSIAN. 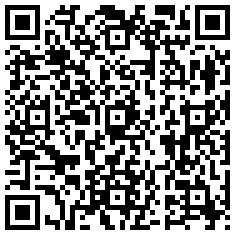 – Rate it, give it +1, comment it, share.